Okay, so I admit two things. First, I hate MSIE6 with a passion; IE7 isn’t much better; IE8 is an improvement (unless it’s in quirks mode, but let’s not talk about that). Second, I came upon this after my initial searching turned up nothing. Once I got this trick to work, I was convinced this shouldn’t work and that there had to be a better way of doing it. So, I did a little more digging and then stumbled upon the very last response to a similar predicament on Stack Overflow. The poster obviously didn’t check their reply, because two fragments that look like they should have had example code are blank. It’s worth reading, though, and it gave me comfort in knowing that someone else was doing the same naughty things I was! Either way, it didn’t matter–I figured out a separate way to trick MSIE without having to litter the page with new CSS classes or make any unusual modifications to the DOM. Better yet, my solution gives you some programmatic control. It does rely on a similar trick, however, and should probably be taken with a grain of salt. Of course, there’s about a dozen different ways you could do this, including many more that others have undoubtedly pointed out over the years (the earliest reference I’ve found in my searches goes back to 2008, but good luck finding them through Google). // Do your stuff here. // Do IE6-specific stuff here. …jQuery? Nope, it doesn’t. I’m aware of that. However, because there are so many similar questions (“how do I detect browser X…”) related to jQuery and very few answers that actually provide a working solution that doesn’t include the deprecated $.browser methods, I figured that it couldn’t hurt to write something that has the words “detect,” “ie6,” and “jQuery” all in the same post title. This post remains for historical reasons, but what it was intended to fix is no longer applicable. All versions of Chrome since the latter v12 releases or early v13 releases should display smooth fonts of any size under Windows. If they don’t, you might need to adjust your OS’s font settings. This trick no longer appears to work as of the latest Chrome release (12.0.741.100 as of this writing). In the comments below, Flix suggested using -webkit-transform instead to shift rendering to the GPU, but the effect is identical to the CSS hack listed here as far as I can tell. That is, neither works. Using a standard visible drop shadow does work, however. You will notice that there is no marked difference between the first three. Only the fourth appears to be smoothed; it is also the only one with a visible drop shadow. Twas fun while it lasted! There. That’s all. 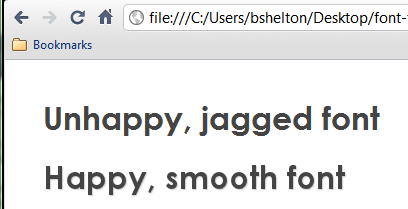 Now you can enjoy (reasonably) smooth fonts across major platforms, provided your users are using Chrome. If you care to know a little bit more about how I discover this, keep reading. If reading is something you’re allergic to, you can continue on to something else. Obligatory disclaimer: I’m not much of a designer. I enjoy writing back ends more than I do UIs, but I do occasionally dabble in the world of web-facing user interfaces in addition to various UI libraries like jQuery and its myriad plugins. Sometimes, though, there is an intersection between the world of server software and user interfaces. Occasionally, I notice things that I haven’t read elsewhere; of course, this is such a rare circumstance that I tend more often than not to simply assume I’ve completely lost my mind and go about tending to other chores. 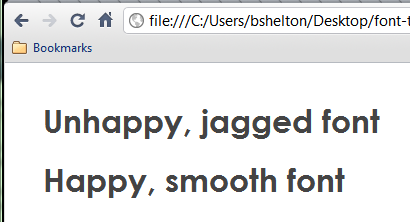 So, let’s talk about font smoothing in Chrome. If you haven’t discovered this already or haven’t read the musings of someone else who has, I’ll quickly share the basic premise. Simply put, larger font sizes look ugly in Chrome (Windows). I don’t know the technical aspects behind this, and Chromium on other platforms isn’t susceptible to the same shortcomings, but if you’ve carefully designed a site on some Unix-like OS like Mac OS X or some flavor of Linux with sub-pixel smoothing enabled, you’re going to be sorely disappointed with the fonts on Windows. While this hack doesn’t work for other browsers–Firefox 4 appears to smooth all fonts and MSIE 8 just ignores what we’re going to do–it does work exceptionally well for Google Chrome. Ah, yes, you say. But you don’t need the blur radius argument! Of course, my cautious inclinations suggest to me that it’s best to match the colors to your background anyway, but for browsers that honor text-shadow, support for rgba() is included as well and as such, the text shadow will never appear. This trick is a hack, because it appears to coerce Chrome’s font rendering engine into smoothing fonts that it would ordinarily ignore. Comparing other Webkit-based browsers on Windows (Arora and Safari, specifically) appears to suggest that Chrome uses a hybrid rendering scheme that is a cross between a built-in rendered and Windows’ default. For instance, Safari will render everything as a jagged text if the default (Windows rendering) is selected but will switch to smooth font rendering if any other mechanism is selected. Arora provides no such option, nor do many non-Webkit browsers like Opera. Obviously, you should only apply text shadows to text that you intend to use a drop-shadow on or other similar visual effect, and using this trick on small fonts (~12pt) will produce text that is almost unreadable. While there’s nothing inherently wrong with (ab)using text-shadow, you’re probably much better off using it as it was intended! This trick does not work for any other browser on any other platform than Google Chrome for Windows. Tested with Chrome v10.0.648.151. It seems that nearly everyone who has dabbled to one extreme or another in PHP has a few gripes related to the language’s ad hoc design. It isn’t a very elegant language, nor is it well-suited to much outside the world of web applications. What it does do it does reasonably well, and its bar of entry is low enough that even novices can have a working site up and running with some dynamic components here and there within a few days of playing with sample code. Unlike more complicated frameworks of the Java, Python, or Ruby worlds, PHP requires little–if any–knowledge of common design patterns and practices. For better or for worse it’s a language that grew out of a set of utilities and still retains much of this feel–and design. The volume of “PHP annoys me” articles have blossomed tremendously over the years. I think this is partially the result that those of us who essentially “grew up” with the language are now discovering with increasing frustration that the very things which made the language easy to use are what cause it (or more appropriately us) so much grief. I’d like to contribute a little to beating this particular dead horse. Maybe it’s not quite dead yet. Ahh, how I could make a Monty Python reference out of that!